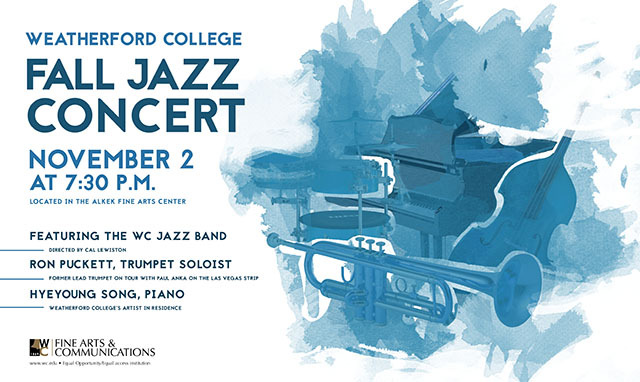 In addition to the jazz band directed by Cal Lewiston, the concert will feature trumpet soloist Ron Puckett and pianist Dr. Hyeyoung Song. The evening’s line up includes “I Can’t Get Started,” arranged by Curtis Wilson, the retired Director of Jazz Studies and Professor Emeritus at Texas Christian University. Wilson will be in attendance at the concert to conduct his arrangement that will feature Puckett on trumpet. The WC Jazz Band also will perform Wilson’s arrangements of the big band classics “Undecided Now” by Charlie Shavers and “Sing, Sing, Sing” made famous by Benny Goodman. There will also be a special piano solo by Song of Lewiston’s tribute to Weatherford College which he titled “WC Trilogy.” The composition comprises three parts, with each representing a time period in the 150-year history of WC. The solo will be performed on a grand piano recently donated to the college by Jayne and Dan Curlee. Also included on the program is a performance by the brother and sister duo, Reece and Netanya McKeown, of Lewiston’s piece for vibraphone and flute, titled “Ces’t Que Ce Ces’t” (It Is What It Is).